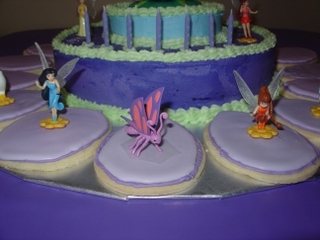 My daughter wanted a Tinker Bell cake for her birthday, but in addition to a Tinker Bell cake topper, she wanted lots of Disney Fairies on the cake also. It was easy enough to find the fairy figures, but I spent some time trying to decide a cute way to put all of them on the cake. A flower seemed like the place that fairies would play so I decided the cake should be shaped like a flower. I used an oval cookie cutter for the petals and a 10-inch round pan and an 6-inch round pan for the flower middles. I hope you enjoy this Tinker Bell cake. Below are the easy instructions. 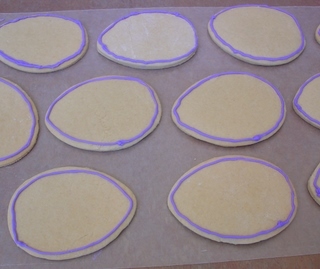 Make 16 oval shaped sugar cookies and allow to cool. When cookies are cool, make royal icing. Using Wilton food coloring paste, tint 1 cup of full-strength icing to the desired shade. This icing will outline the cookies. Add icing to decorating bag with small round decorating tip (#2 or #3 Wilton tip). Outline each cookie. Allow icing to dry. Thin the rest of the royal icing by adding a few drops of water at a time and then testing to see if it is thin enough to flow. Add Wilton food coloring paste to the desired shade. This icing will fill in the cookies. Fill in the cookies with the icing by squeezing icing back and forth across the cookie, allowing the icing to run and flow together. Allow icing to dry on cookies. Make the cakes according to recipe and allow cakes to cool. When the cakes are cool, fill (optional) and ice the bottom cake in the center of the cake board. Fill (optional) and ice the top cake on a round cake board. Place the top cake in the center of the bottom round cake. Decorate the two cakes however you would like. My decorating job was simple. I did a shell border at the top and bottom of both cakes. I made rosettes to hold the candles. Place the Tinker Bell cake topper in the center of the 6-inch cake. 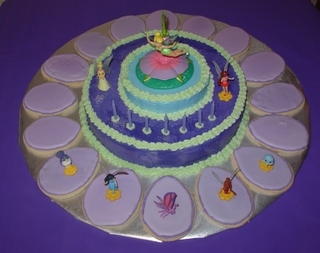 Arrange the oval cookies around the 10-inch cake to resemble petals. Add additional fairy figures, as desired. Place the candles in the rosettes. Congratulations, you are finished with this amazing Tink cake. This cake is unique, but simple enough for beginning cake decorators to be able to complete. 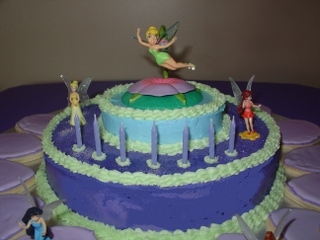 This cake will be a hit at your Tinker Bell birthday party.